So to sum up, “A Game of Shadows” is a cozy match to “Sherlock Holmes,” and while it sometimes feels. With the element of surprise now a distant memory, the "Sherlock Holmes" franchise elects a threatening route of sleuthing to entice fans back into the realm of mystery. Although never grim, "A Game of Shadows" dials down the sometimes absurdity that defined the 2009 blockbuster, a quality that did an amazing job clearing away the cobwebs, nudging the name of Sherlock Holmes back into pop culture. While it runs a little harsh at times, the sequel remains a sturdy vehicle for Robert Downey, Jr. to weave about with playful concentration. As follow-ups go, "A Game of Shadows" is most certainly a sequel by the very definition of the word while still able to maintain originality of its own so the viewer doesn't feel as though they've seen this before. Working on his experiments, disguises, and plans to disrupt the wedding of his dear partner, Watson (Jude Law), Sherlock Holmes (Robert Downey, Jr.) has encountered his greatest opponent in Professor Moriarty (Jared Harris in a wicked supporting turn), an evil mastermind who delights in elaborate, regal methods to dispatch his enemies. Finding himself a target, Watson reluctantly joins Holmes in his investigation of Moriarty, soon greeting Sim (Noomi Rapace), a mysterious Gypsy fortune teller whose brother has been kidnapped by the professor. Working their way around Europe, the trio encounters all types of assassination attempts and treachery, urging Holmes to play this game of death differently, facing an opponent relentless in his dedication to havoc, taking his fixation to the world stage. Armed with his wits, skills, and trusted Watson, Holmes embarks on his greatest quest, delighting in the challenge, even if it ends up killing him. Re-imagining Holmes as a hyper-intelligent action figure, Ritchie reworked Arthur Conan Doyle's dearly loved character for a new generation practically unaware of the detective's literary exploits. The film maker freshened Holmes up in a spectacular way, breaking down his gifts of analysis and fist-first fury into mathematics, using arresting visual cues to emphasize Holmes's buzzing mind and unparalleled physicality. The original picture also benefited from a wry supporting turn from Law, delivering consistent straight man work as Watson, a brother/mother figure to the ever-impulsive Holmes. Matched with Downey Jr. and his animal instinct, the pairing couldn't be beat. "A Game of Shadows" doesn't enjoy the comfort of introductions, plunging right back into the thick of the hunt, greeting Holmes as he sorts out unfinished business with Irene (Rachel McAdams). Ritchie isn't one to linger on the past, rocketing the sequel forward into Moriarty's domain, where the professor is staging an epic plot of bombings and Euro distortion to reach a secretive end game. Where "Sherlock Holmes" was juggling characters, motivations, and back stories, "A Game of Shadows" is merely content with Holmes vs. Moriarty, taking a few moments off to deal with Watson's tattered nuptials (Kelly Reilly is once again Mary) and make a little room for Sim and her own interest in the professor's doomsday design. Play time is limited here, which is a shame. Downey, Jr. and Law are so wonderful as the detective duo, they could have an entire movie of bickering to themselves and it's unlikely anyone would object. The actors and the characters make an impressive team, and Ritchie exploits the prickly chemistry further during a exquisite train ambush sequence where the boys face a new enemy armed with increasingly destructive weapons. Still, the camaraderie isn't enough, pushed aside to establish the moodiness of the screenplay, building Moriarty as a formidable villain capable of administering great pain when pushed too far. "A Game of Shadows" isn't particularly hostile, yet a certain spark is missing from the sequel, a lightness to the caper that was appreciated the first time around. The execution is just a tad oppressive at times, sucking the life out of the room. There remains quite a bit of fun to be had in "A Game of Shadows," including the introduction of Holmes's brother Mycroft, played with a lovable sense of amusement by Stephen Fry, having a ball in and out of his clothes. Today "A Game of Shadows" hits stores on Blu-ray 2 disc pack, and it is loaded with some interesting features. But first let's discuss the visual and audio aspect; if you don't own an HDTV and surround sound system then you will be severly out of the loop when it comes to this film. As with the previous film, there are quite a few large explosions, a jangled musical score and elaborate set pieces that just wouldn't look or sound the same any other way. Particularly during the running through the woods sequence. As for special features, what we have is an interesting feature called Maximum Movie Mode. Hosted by Downey Jr himself, he talks you through the film as only he can. Along with that is a movie app which can be synched to the Blu-ray opening up even more special features. Disc 2, as always, contains the standrard version of the film + an ultraivolet copy as well. So to sum up, "A Game of Shadows" is a cozy match to "Sherlock Holmes," and while it sometimes feels a small touch off the mark, the core elements that made the original film such a treat remain happily in view. Download Sherlock Holmes: A Game of Shadows from the iTunes Store in Digial HD. 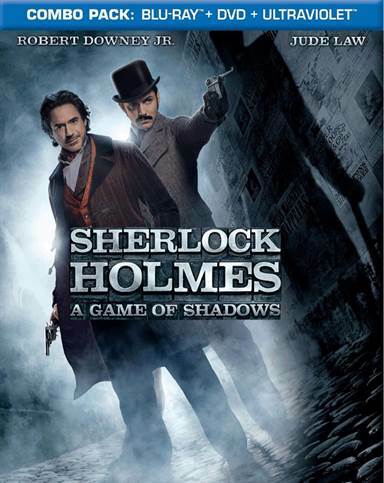 For more information about Sherlock Holmes: A Game of Shadows visit the FlickDirect Movie Database.